"As long as the Lion holds his fabled place as the king of beasts, and the eagle as king of birds, the sovereignty of British Trees must remain to the Oak. In truth he is a kingly tree, the emlem of majesty, strength and durability." So wrote The Reverend C.A. Johns at the end of the nineteenth century. At one time, because of its strength oak was used to build ships ("Hearts of Oak are our ships, jolly tars are our men"). Most of the oak for the ships came from the Forest of Dean in West Gloucestershire. But it was in great demand also in the middle ages for furniture, houses, ships and bridges. Name origins Derives its name from Old Enlish "ac",old norse "eik", German " eiche"
Uses Tannin , feeding pigs, erzatz coffee, used in some countries as food by the early greks being able to be stored away in Winter. Mythology and tradition . The greeks believed that the Oak was the first tree. 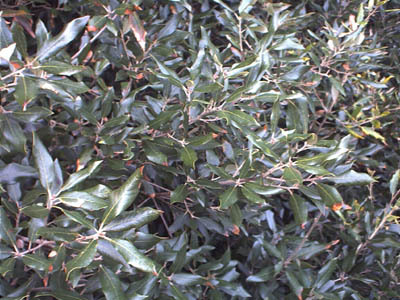 The many mentions of the Oak in th eBible probaly refer to the Evergreen oak ( Quercus Ilex). At Tamerton Foliot, near Plymouth, an old tree in the centre of the village is known as the Coplestone Oak. It is said that, at this spot,the Lord of the Manor, Christopher Coplestone, lost his temper with his godson and stabbed him to death. Ther is an old Druidic belief that oaks are sacred and possess special powers. 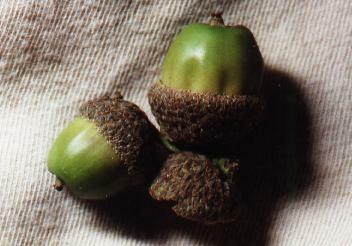 It was said that if you carried an acorn in your pocket all the time you would remain looking youthful. 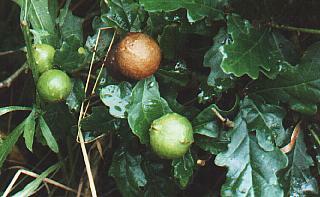 Sometimes the leaves develop growths,known as "galls" or "oak apples". These are a reaction to a gallwasp ( of the Cynipidae family) laying its eggs in the leaf. At one time gallic acid was extracted from these galls and was used in the manufacture of ink. There is a well-known folk song dedicated to the Oak. One version was written in America in 1837 byHenry Fothergill Chorley. And his fifty arms so strong! When the storms though the branches shout. When a hundred years are gone.